Tableau Takes Next Steps Toward Smart Analytics | Constellation Research Inc.
Tableau’s Empirical acquisition is its latest move toward machine-augmented analytics. Here’s a look at the company’s ‘smart’ features. Tableau last month announced the acquisition of Empirical Systems, an artificial intelligence (AI) startup with an automated discovery and analysis engine designed to spot influencers, key drivers and exceptions in data. It was Tableau’s second acquisition over the last year aimed at accelerating so-called “smart” capabilities and part of a larger push that began in 2016. As I wrote in my January report, “How Machine Learning and Artificial Intelligence will change BI and Analytics,” consumers and businesses alike are increasingly interested in smart capabilities powered by heuristics, machine learning (ML) and natural language processing. In the area of analytics, these smart capabilities promise to take us beyond the limits of self-service. Despite the embrace and success of self-service over the last decade, it’s increasingly clear that this approach alone is not enough to truly democratize data-driven decision-making. Self-service tools aren’t always intuitive for nontechnical business users. Even more data-savvy users sometimes need help when selecting data, determining how to analyze that information, and deciding how best to visualize and share insights. To make things easier for novice and experienced users alike, BI and analytics vendors are developing smart capabilities in at least four areas: data prep, data analysis and discovery, NL query, and prediction. In my latest report, “Tableau Advances the Era of Smart Analytics,” I detail the smart capabilities that Tableau has delivered to date, where it needs to fill gaps, and the strength and weaknesses of what it calls its augmented analytics strategy. Tableau started stepping up its smart capabilities in 2016 with automated clustering and forecasting capabilities. It followed in 2017 with smart table-, join- and data-source recommendations. This year Tableau also introduced a number of smart features within its Tableau Prep data-preparation offering, introduced in April. 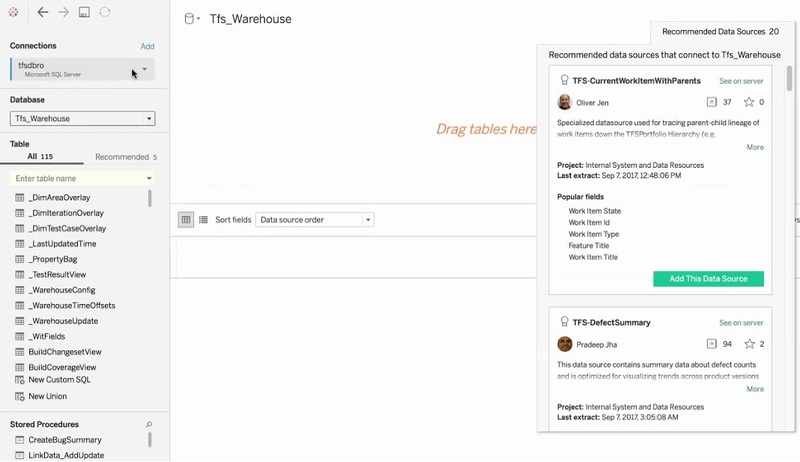 Tableau’s recommended-data-source feature delivers user- and context-specific suggestions. One of the gaps in Tableau’s smart lineup, at this writing, is natural language query, a feature that let users ask questions of data in plain English rather than using SQL code. This gap sparked Tableau's 2017 acquisition of ClearGraph, a startup focused on natural lanaguage query. It's well known that Tableau is working on bringing natural language query capabilities into its products, but it has yet to announce release dates. I’m not the only analyst predicting that we'll see Tableau's NL query nnouncement in 2018 -- mostly likely at the Tableau Conference in October. As noted in my report, Tableau is far from alone in delivering smart features and it has not been the first to deliver all of the smart capabilities it now offers, but the company’s pace of investment has accelerated over the past three years. I see Tableau as now having a solid start on delivering expected smart capabilities, and it's adding these features as built-in (no-extra-cost) aspects of its core products. Given that Tableau has more than 74,000 paying customers and hundreds of thousands of users, its efforts are going to go a long way toward brining smart capabilities to the market.